I chose a kitchen herb garden because I was limited for space in my backyard. Although I do grow herbs in the garden I decided to become a kitchen herb planter as well. (My outdoor herb and vegetable garden wasn’t producing the amount of herbs I wanted for my cooking). So I extended the herb garden indoors to increase production. The most important aspect of growing herbs indoors was having a sunny window. Herbs love natural light. They grow best in the sunlight. If I didn’t have sunlight shinning through two of my kitchen windows I would have scrapped the entire idea of gardening herbs in the kitchen. I also supplemented the sunlight with my electric kitchen lights. I kept them on at times when sunlight wasn’t available through the window. Like early in the morning and after dark. (My kitchen is on the western side of the house). I know you must be thinking that I’m using too much energy. But it is for a good cause, (to plant food). Next I choose the best kitchen herbs to suit my needs. I use a lot of thyme and parsley when I’m cooking so it didn’t make much sense for me to grow herbs that I don’t use. I had near zero demand for other herbs. I also grew herbs that weren’t known to grow tall. I think it’ll be an eyesore in my kitchen to have huge herb plants like rosemary and the wild mint. So I deliberately avoided them. I prefer to buy starts than having to set seeds and waiting for them to grow. 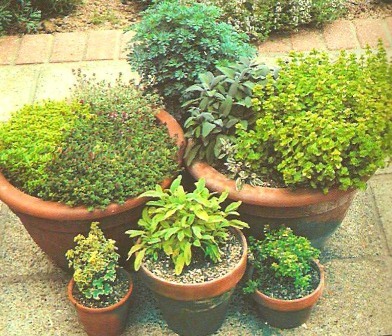 A kitchen herb garden should be quick and easy. So I get herbs from my local nursery and bring them back home to transplant. I also purchased six larger containers to put the herbs into. I know that the herbs will be growing and require more space so I didn’t want to leave the starts in the same containers they were bought in. I loosened the roots of the herbs by lightly slapping the container. (I wanted to be gentle. I heard that if you’re too rough you could break up the roots and this causes the herbs to take a while longer to grow). I then transplanted them into the bigger containers located under the sunny window. Herbs that are grown indoors have to be watered regularly. The soil doesn’t remain moist enough for very long and I don’t think it’ll be feasible to install a drip irrigation system in the kitchen. (By feasible I mean cost). All I do is simply take the pot of herbs and place it into the sink and turn on the tap. Why spend money on a watering system when it’s that simple? I also place the pot of herbs on plates. I don’t want the water to be running through the container and unto my counter. That can be messy and may damage the cupboard. It’s always a good idea to cut back the herbs regularly. And what I’ve noticed is the more they’re cut back the better they grow (and taste). So I identify the leaves that look damaged or dried up and pluck them off. By doing this the healthy leaves are able to get more nutrients than before. This adds to their taste. Pruning is necessary to prevent the herbs from going to seed. Most herb leaves loose their flavor and become sour if the herb plant produces flowers. If this happens my kitchen garden would be all in vain. So I cut off the top of the herb plants with a pair of scissors. The leaves that are cut away from the top usually end up in my dishes and this is the purpose of growing herbs indoors. Using a kitchen herb garden has helped me (to some degree) to solve my main gardening problem (limited space). It also allows me to enjoy herbs that I am unable to grow outdoors because I have no place left to grow them. The kitchen herb garden awards me with the luxury of a wide range of fresh herbs to use in my cooking.